Tonight is going to be great! We’re having an event with Zak Sally (Sammy the Mouse), Dale “Tooth” Flattum and John Porcellino (King-Cat Comics). It starts at 7pm. Click here for more info. Anyway, New Stuff This Week! 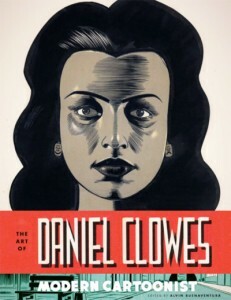 The Art of Daniel Clowes: Modern Cartoonist by Alvin Buenaventura (Abrams) $40.00 – Don’t miss Dan Clowes and Alvin Buenaventura signing this book here on May 17th! Roctober #50 $5.00 – Don’t miss the release event for this zine (this year makes its 20th anniversary!) here on March 30th. Zine World: A Readers Guide to the Underground #30.5 $1.50 – Supplement between #30 and #31 of this popular zine review resource. Garbage Pail Kids by The Topps Company Inc. (Abrams) $19.95 – This exciting follow up to Wacky Packages includes spectacular artwork and over-the-top satire, featuring inspired collaborations between avant-garde cartoonists and humorists including Art Spiegelman (who wrote the intro), Mark Newgarden, John Pound, Tom Bunk, and Jay Lynch. All 206 rare and hard-to-find images from Series 1 through 5 are collected in an innovative package, along with a special set of four limited-edition, previously unreleased bonus stickers. Everything we list on our blog is available at our brick and mortar store. But not everything we sell at the brick and mortar store is available from our webstore. Click here to see what is new in our webstore!